Driver Profile: Still Expediting and Loving It! Jim Bell, 58, didn't begin his working life behind a steering wheel: "After high school, I worked as a general laborer in a steel mill in northern MI," he says. "I worked there two years, then went to work for Michigan Consolidated Gas in the Ann Arbor area. I stayed with them for around ten years and it was there that I learned the trade of pipefitting." "I left the gas company and went to Goodyear Tire and Rubber as a pipe fitter. That job lasted three years until the "Jimmy Carter" recession caused layoffs. I decided to try my luck again in northern MI, working odd jobs up there with a few trips back to southern Michigan, again working as a pipe fitter on construction and industrial jobs." Jim and Norah, 57, were childhood sweethearts and were married while Norah was still in high school. Norah says humorously that when they attend high school reunions, "old friends are shocked that we're still together." The couple has been married 37-1/2 years. They have 3 adult children - two daughters and one son. Their son is an expediter as well, leased to Tri-State Expedited. They are also the proud grandparents of a girl and two boys. In addition to raising their three children, Norah drove a school bus for twelve years, as well as other odd jobs during the couple's child-rearing years. Jim states, "At one point, we decided to try operating a foster care home. We did that for about five years until the clients basically outgrew the home. Our own children were just about grown at that time, so we figured it was time for a change in professions." "At about that time, my brother-in-law bought a "Michigan train" and I went with him a few times and started to learn how to drive. I got into steel hauling and bought my own tractor. I pulled a 26-foot lead trailer and 24-foot pup, both equipped with a "centipede" tire set up. I could carry 161,000 lb. gross from Michigan to the Indiana steel mills." "I got tired of the flatbed life with tarping and chains," Jim continues. I bought an Astro tractor and a van trailer and ran for Central Transport. Eventually, I replaced the Astro with a Freightliner COE." "We heard about Roberts Express from my sister sometime in the late 80's; in the meantime, we had moved back down to Ann Arbor. I was on a steel run to Chicago when Norah, my mother and my sister all went to meet with the Roberts Express recruiter. My mother came back from the meeting and said that we should all go into the trucking business together." "She said that we could buy these "little" trucks and make all this big money. It turned out that we made a lot of money with our "little" truck in the beginning." Norah had operated with Jim as a team, pulling flatbeds and dry box for a few years before entering expediting. "When the opportunity to work in the "little trucks" (expediting) came along, I said 'this is it," Norah explains, "it doesn't bend in the middle, I like driving this! I didn't like driving the big trucks in traffic or backing into the docks." Jim picks up the story, "Our first expediting truck was a Ford Super Duty with a coffin sleeper and a 14 foot box. That was the standard Roberts Express "C" truck at the time. We made a lot of money in that one, and we had it for five years. When I tell people about those times, they look at me like I'm crazy, but we could leave the house on Wednesday afternoon and be back late Saturday with $3,000 for those four days." "Looking back," Jim says, "it was kind of unbelievable, but it was a new market. We signed on with Roberts Express in '89 and were with them for 6 years. We eventually moved up to a "D" unit; in fact, we wore out two "D" units with Roberts. At one point, Jim and Norah became fleet owners with a total of 9 trucks leased with Roberts. Their fleet consisted of six "D" trucks, two cargo vans and an "A" unit that Jim's mother would run occasionally. As time went on, trustworthy drivers became harder to find, so the couple got out of what Jim terms "the driver business." Fortunately, they were able to dispose of the fleet one truck at a time with no financial loss, but kept a "D" unit that had been spec'd for Jim. Around 1995, Jim says that some issues developed with Roberts Express and the couple decided to test the waters with another carrier. "I had spoken before with Darin Mark who was in the Safety department of Landstar Express America at that time. As a matter of fact, I was on the phone with Landstar Express and about to make the move to their company, when a friend called me on my cell phone. He told me that there was someone in Ann Arbor wanting to talk to me and to call them right away." "We arranged an interview with Con-Way NOW which was just starting up, (and only five miles from our house), and we stayed with them for five years." Jim speaks highly of the companies that he has been leased with: "We did well at Con-Way NOW and made a lot of money with them. It's still a good company and we still have friends leased with them." "Roberts (now FedEx Custom Critical) was a great company as well, and it is probably still a great company in a lot of respects. After all, with all of the expediters you see out here, there's probably a Roberts connection somewhere in their background - Roberts trained so many expediters." Jim collaborated with a friend on putting the Bells' truck together: "He was having some difficulties at home, so he called me up one day and asked if I wanted to buy it." Jim and Norah work their business today in a 1996 Freightliner FLD 112 with over a million miles on the clock. It's powered by a 350hp, M-11 motor hooked to a ten-speed trans and twin rear axle setup. Their FLD features a raised roof 70" integral sleeper in front of a 24- foot cargo box. The sleeper is equipped with a refrigerator, TV, laptop (of course) and inverter. "We had a microwave, but we never used it, so we took it out. The truck also mounts a Rigmaster generator. Jim does some of the light maintenance on the truck himself: He changes belts, checks coolant and lubes the truck. He tells us that the six new injectors installed last year were the extent of major repair on the truck. 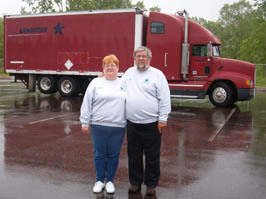 Jim says, "I find that the twin axle on our truck has increased our freight capabilities. It's getting us out of places that we've never gotten out of before. We've been out in the Western states, and the slightly larger box and heavier cargo capacity have gotten us some loads that otherwise would have been tractor-trailer freight." "With all the extra stuff I carry - load bars, pads, 2 side tool boxes and the generator - we can scale 22,000 pounds in cargo. There have only been a couple of times when we were close to the limit. It pays well too; Landstar will pay the "E" rate for those heavy loads." "Landstar has been very good to us and Darin Mark, who is now the Director of Recruiting, has become a good friend." "With Landstar, I like the fact that we can get freight from Landstar's sister companies; it pays almost as well as the regular Landstar expedited freight. We have availability of freight in dead areas; we can canvass their agents and find work." "You've got to be pro-active, though. You've got to have a laptop and access Landstar's site and do a load search. We call our agents as well, but if we've been sitting for a day, we start looking at the LTL board and start calling on those loads. If you put two or three of those loads together, you can make pretty good money." "Expediting is a constantly changing and evolving business. I think a lot of companies have reduced rates and accepted LTL freight rather than expedited freight, but you can't really blame them there, they have to show a profit." "The truck capacity is changing, they're getting away from the cargo vans. There are more and more vans and less opportunity for them. I think the "D"-sized truck is what everyone will settle on." "It'll take a few months with this system to learn that you have to be pro-active and make your own decisions. You won't be paid to deadhead somewhere and sit for three days; it's your money and you've got to make the most of your time." Jim says somewhat jokingly that a key part of expediting freight is customer mistakes. At the time of this interview, he was enroute with an emergency delivery of a 20 pound bottle of compressed gas that he picked up at one of Landstar's sister freight companies. He says, "Because of someone's error, what would have cost them $20.00 to ship is now costing them $1,500.00! Norah Bell shares her thoughts on the freedom available in this business: "I don't know where else we can only work eight months a year like in expediting and make what we do. When you're an independent business owner, you need your own time when you want to work, and when you need to take off. I took a month and a half off this year to stay with our daughter because of her surgery, and I don't know what other job would allow me to do that." "When we want a vacation, we take it; we spend a lot of time in Myrtle Beach! If we have other family obligations like a graduation, we're able to go when we want." Norah says that she and Jim share most of the duties of driving, with the exception of maintenance. She handles the couple's paperwork chores, but says that Jim is responsible for his own logbook. Jim says that the couple is averaging 120,000 miles a year. He tells us that they "take it easy from about mid-January up until around the truck show in late March and spend a lot of time at home." "Expediting will be with us in one form or another. I don't think you're going to see a sharp decline in this business like say, hot shot freight has suffered. It's a niche industry, but that's the great thing about trucking, there's a niche for everybody." "The truck capacity is changing; they're getting away from the cargo vans. There are more and more vans and less opportunity for them. I think the "D"-sized truck is what everyone will settle on. Shippers have gotten smarter. If they're going to expedite, they're going to get all they can on the truck. It's all about cost-effectiveness." Norah says that when the couple has some downtime on the road, they occupy the hours by visiting the network of friends they have across the country. Sightseeing is another hobby; knitting and crocheting for Norah, reading and laptop time for Jim. The Bells have made many friends during their years in expediting and enjoy meeting up with those folks out on the road. "We like the freedom of Landstar; we're not being told to 'go here and guard the fort' as they say. The Landstar people that we deal with are just wonderful. We find everyone to be driver-oriented, helpful and professional. "Don't go buy a truck right away - go drive for someone first. If it's a husband/wife team, make sure you can get along; it's a very confined space you're operating in. You're together 24/7, and we've known it to break up marriages. "You've got to know your day-to-day living expenses, your fuel expenses and your truck expenses. That comprises your bottom line. We have a weekly and monthly bottom line that we try to meet. More often than not, we will exceed the monthly line; you have to look at it from month to month and do whatever it takes to meet that line." "This business is not about big trucks, it's about little trucks, and there's not usually a load waiting for you at the other end. We don't think you can operate effectively in expediting with a Class 8 'mentality." What tips can you share about running your own business? "Keep good records, use a spreadsheet." "Keep track of your fuel expenses, and where you buy fuel. You can spend a lot of money in fuel taxes that you don't have to spend if you don't buy your fuel right." How do you make a relationship work in the close confines of a truck? "There's an old saying that goes: When the fires of passion die to an ember of hot coals, make sure that you've married your best friend." "Norah and I don't make independent decisions that effect both of us - we discuss it first." Favorite part of the country to drive? "We like the western and midwestern parts of the US best. Its not as congested." Jim says, "One load that stands out was a recoil cylinder for a 105mm howitzer (cannon) that went to Dugway Proving Grounds in Utah. An Army captain met us at the gate and escorted us to the shipping/receiving area. Once there, he then mentioned that he would like the shipment delivered to 'his area." "Norah had to remain at the shipping/receiving area, so after I was cleared by the Military Police, the captain escorted me to 'his area' - FORTY MILES out in the desert! After being cleared at another checkpoint, I was handed a gas mask and told that if I heard a Klaxon warning horn, to put the mask over my head and grab on to the captain, because he would direct me to a safe area. It was then that I discovered that they tested Sarin gas in that area!" Darin Mark, Landstar Express America's Director of Recruiting says of the Bells: "Jim and Norah are very special; they are the kind of people that you meet in this industry who make you feel like you're doing the right thing. They are among the most professional expediters I've had the pleasure to know, and I regard them as friends."